"Hot Solder Dipping (in Tin-Lead Solder)" of Tin-Plated Surfaces is a Commonly Referenced Mitigation Strategy Against the Threat of TIN WHISKERS. HOWEVER, this Photo of the Month illustrates that typical hot solder dipping processes may NOT provide complete protection against whisker formation. The crystal oscillator shown in this example was manufactured with 18-mil diameter "bright" tin-plated Kovar (Fe-Ni-Co) leads. The oscillator manufacturer also Nickel-plated the Kovar wires prior to tin-plating (i.e., Nickel underplate). In this example, the end-user of the device required the leads to be "hot solder dipped" in Sn63/Pb37 to within 50-mils of the oscillator package just prior to mounting to the printed wiring board in order to improve solderability. NOTE: Many assemblers restrict the depth of immersion in the solder pot to no closer than ~50 mils of the device package in order to minimize the risk of inducing package related problems such as cracked glass seals. Approximately one year after mounting the oscillator in a system, the end user experienced a loss of oscillator output. 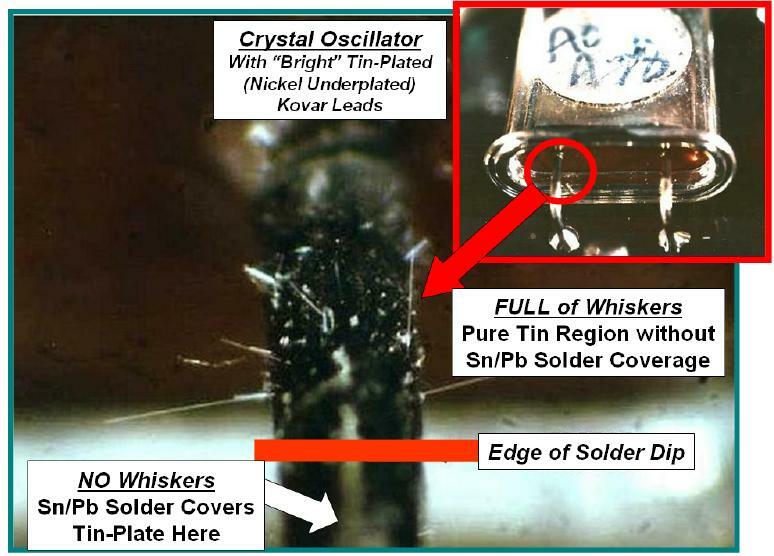 Failure investigation revealed that TIN WHISKERS (shown above) had formed on the portion of the oscillator lead wires that were NOT covered with Sn/Pb solder during the assembly process (i.e., hot solder dip followed by hand soldering). Specifically, a 60-mil long tin whisker was found to be bridging the lead wire to the oscillator's metal case causing the observed failure condition. Most (if not all) mitigation strategies against the threat of tin whiskers have limitations. When considering any mitigation strategy, the end user must be aware of the applicability, strengths and weaknesses of the specific techniques being employed. In this example, only those regions of the tin-plated lead wire that were completely immersed in Sn/Pb solder remained whisker free. Neither the use of Nickel-underplate (also commonly cited as a whisker inhibiting factor) nor the "annealing" effects (if any) on the non-dipped region during the hot solder dip process were sufficient to prevent the formation of damaging tin whiskers.